Another double win weekend for Mathieu van der Poel - All the action and video from Gavere and Jaarmarktcross. Urán to start 2019 in the Colombia Oro y Paz tour - Top Story. Loads of other cycling news: Top teams for the Gent '6 Day' starting this week, Jakob Fuglsang plans 2019, Chapter2 and Bigla team, contract news, Andrea Tafi has team for Paris-Roubaix'19, boxing Michael Boogerd and Eddie Dunbar 2019 video. Monday news and coffee time. In an interview with Ciclismo Internacional, EF Education First's Rigoberto Urán has said he will start his 2019 season in his homeland of Colombia. The 31-year-old rider said: "It is nice to be able to start in your own country. There is an incredible passion for the race in Colombia," one of his main reasons for riding the Colombia Oro y stage race (11-17 February). The Colombia Oro y Paz had its inaugural event in 2018 and was won by the young Colombian Sky rider, Egan Bernal. The 21-year-old rider defeated Nairo Quintana (Movistar) and Urán after a tough battle. Urán also won stage 5 in Salento and hopes to be in the fight of the final victory. "The first edition was very well organized, that is why more teams want to come. I think this race can grow even more. Everyone wants to visit Colombia because of the love for the bike and the respect for the riders." Chris Froome has already confirmed his participation in the Colombian race and Spanish newspaper El Pais says that World champion, Alejandro Valverde (Movistar), is 99% sure to be on the start line in Antioquia. Mathieu van der Poel (Corendon-Circus) won the Superprestige Cyclo-cross in Asper-Gavere on Sunday to do a weekend double, again. The European champion was dominant again with Toon Aerts (Telenet Fidea Lions) in second place at 24 seconds and World champion Wout van Aert (Cibel-Cebon) in third at 35. Van der Poel was the fastest from the start gun and left Wout van Aert in sixth position. Toon Aerts was the only rider to hold the European champion and by the end of the first lap the lead was already 20 seconds. Van der Poel was in the lead position with Aerts occasionally coming to the front. 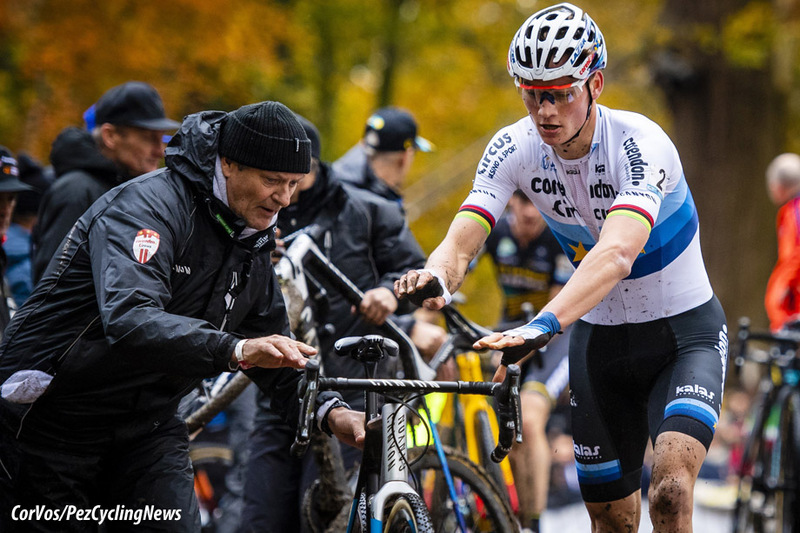 The Dutchman had the Belgian in trouble at every bend or downhill section and Aerts had a continual fight back to the flying Van der Poel's wheel. After around 20 minutes of racing, the European champion decided it was time for his expected solo move and he was gone. Aerts needed to recover and was caught by Van Aert at the half-way point and the pair were stuck at around a half a minute from the lone leader, until Aerts found his second breath and headed toward second place on the podium. Van Aert - who did not ride in Niel on Saturday - had to content himself with third. 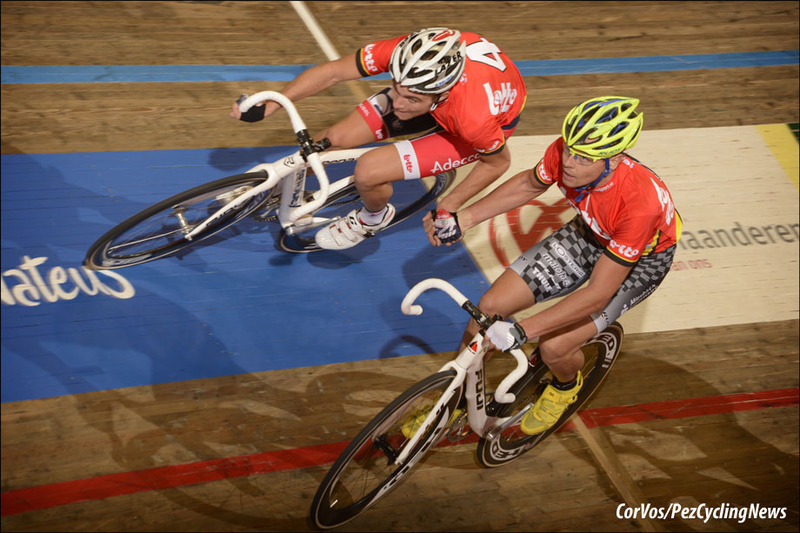 Race winner, Mathieu van der Poel (Corendon-Circus): "This was one of my best technical crosses ever. I did not make a big mistake. It gives confidence to race like that. I wanted to have the same day as last year, but I was perhaps even better than last year. It was also a difficult cross for me. The Gavereberg became more and more difficult every lap. I am tired now." 10. Nicolas Cleppe (Bel) Telenet Fidea Lions at 3:50. 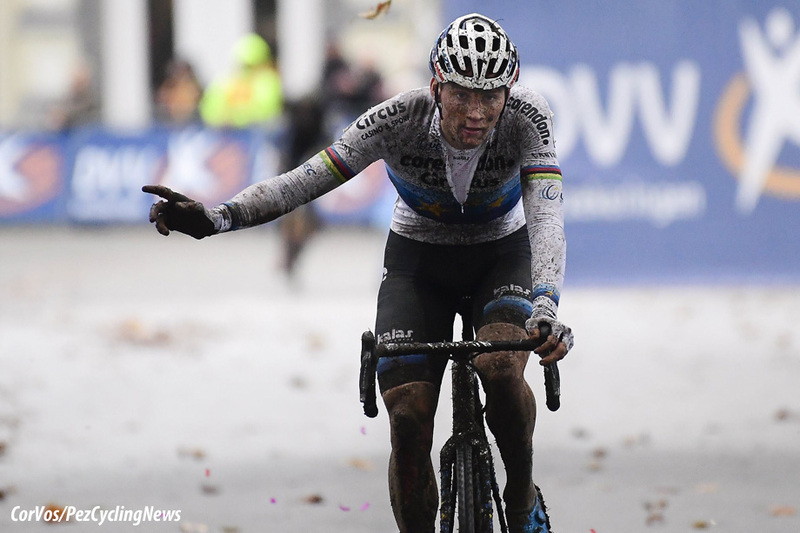 Mathieu van der Poel (Corendon-Circus) won the Jaarmarktcross on Saturday in muddy Niel. The European champion waited until the second half of the race to put Toon Aerts (Telenet-Fidea) and Laurens Sweeck (Pauwels Sauzen-Vastgoedservice) into second and third place. DVV Verzekeringen Trofee leader Toon Aerts got in Niel where he has been waiting for the entire cyclo-cross season: rain and mud, in short real cross. It did not become a heavy race, but the rain made the course slippery and heavy. Aerts was inspired by the weather conditions and made the fastest start. Aerts did not leave that way for long and on the second lap he went down in a slippery corner, just before the intermediate sprint, where he could take important bonus seconds for the DVV Trophy standings. Fortunately for Aerts, Michael Vanthourenhout prevented top favorite Mathieu van der Poel from taking the full bonus. With the help of Lars van der Haar, Aerts quickly closed the gap again to a leading group of four, which had meanwhile escaped. Also present, alongside Vanthourenhout and Van der Poel: Corné van Kessel and a surprisingly strong Tom Pidcock. After twelve minutes of racing, Van der Poel had had enough, and with an impressive maneuver he shot off the front. Apart from Aerts, the others had no chance. Aerts tried, but could not stay with Van der Poel and was left trailing by ten seconds. Laurens Sweeck did eventually close the gap to Van der Poel. When Sweeck made the connection, Van der Poel eased off the pressure, allowing Aerts and Van der Haar to come back for a while. At half way; Sweeck tried to distance himself from Van der Poel and the others. For a short time it worked, but then Sweeck seemed to run out of steam. Van der Poel countered and rode away. A strong Aerts came back to take second place from Sweeck, with Van der Haar in fourth. Race winner, Mathieu van der Poel (Corendon-Circus): "I have quite a lot of wounds on that knee, so if I fall, it is immediately open. I do not have any pain. I tried to race with tomorrow in the back of my head, but trying to race a whole course here alone is very difficult, I think. If the classification is still possible, that would be great fun, but I'm not keen to put that right. I try to win as many crosses as possible and whether that is a minute lead or ten seconds, that does not matter to me." 10. Jim Aernouts (Bel) Telenet-Fidea at 1:26. 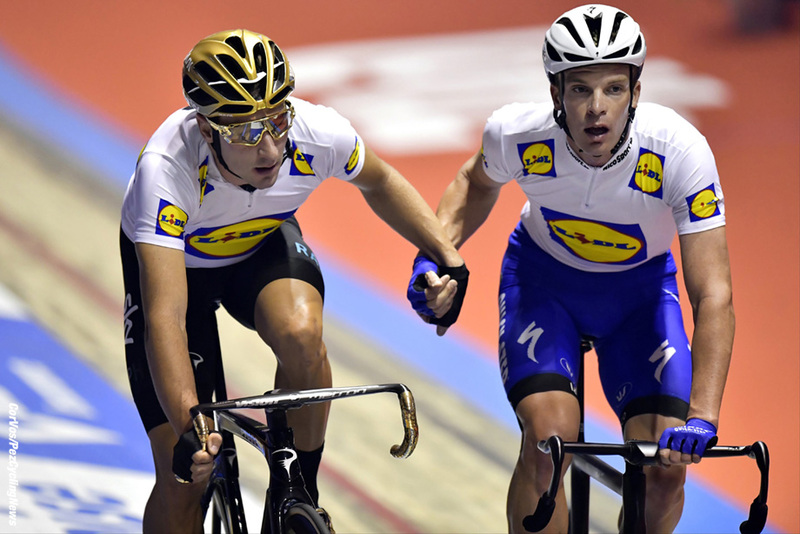 The two Quick-Step Floors riders will team up for the prestigious track event (November 13-18). The 78th edition of the Six Days of Gent will see many all-star pairings line up at the start in the legendary Kuipke velodrome, a 166.66m-long track that promises to deliver fireworks next week, when the riders will take on different races – points, team elimination, flying lap time trial, Madison, derny, sprint, scratch and 500m time trial – which will determine the final ranking. Among the teams that will be vying for overall glory will be also the one comprising multiple winner Iljo Keisse and Olympic Omnium Champion Elia Viviani. For Iljo, this will be the 15th participation at the Six Days of Gent, which the now 35-year-old rider has conquered on six occasions: 2005, 2007, 2008, 2010, 2012 and 2015, a record this century. World Champion and European Champion on the track and winner of nearly 30 Six Day events throughout his career, Iljo – who together with Elia will sport a Deceuninck – Quick-Step jersey – is ready to give it another go in his home race and try to get the better of his rivals, although the road that lies ahead announces itself as a challenging one. This past season has been an unforgettable one for Elia Viviani, winner of 18 races in the Quick-Step Floors jersey and European Team Pursuit Champion. After enjoying a well-deserved vacation following his successful Vuelta a España, where he captured three wins which he added to his four Giro d’Italia stages, the 29-year-old Italian resumed training and is ready for an adrenaline-packed week in Gent. “I’m excited to be going to Gent and riding with Iljo. I’m sure it will be an amazing week, but also a difficult one, because many teams will be aiming for the win. To triumph in such an event you have to be both strong and smart. We are motivated for this, we hope to put on quite the show for all the fans in the stands and to take the overall victory in the mythical Kuipke”, said Elia, who will be at the start for the third consecutive year. Lotto Soudal teammates Jasper De Buyst and Tosh Van der Sande will be participating in the Lotto Six Days Flanders-Ghent, which takes place from Tuesday 13 November until Sunday 18 November. The duo will be riding in the Captains of Cycling shirt. Jasper De Buyst won the Six Days twice: in 2013 together with Leif Lampater and in 2014 with Kenny De Ketele. In 2015, his last participation, he and Otto Vergaerde finished third. Tosh Van der Sande participated for the last time in 2012. It’s the first time that Jasper and Tosh will form a pair on the track. Jakob Fuglsang is looking forward to the 2019 Tour de France. The Danish leader of the Astana team told TV2 Sport: "I hope to ride the Tour and my goal will be the same as this year, I will chase the podium", said Fuglsang. Last season Fuglsang went with high expectations to the French Tour. A month earlier he was second in the Tour of Switzerland, which gave him confidence. Yet he was twelfth in France. He was criticized by former rider Chris Anker Sørensen, who indicated that his compatriot had to give up the classification ambitions and should go for smaller Tours and stage victories. "Of course winning can be fun," says Fuglsang. "First I want to see what the team is thinking about, I still think I can be used for the overall rankings, if I look at the big Tours. I would be full on for the overall in smaller Tours and of course it will not be easy to ride in a big Tour. The bar is high, but I have already been seventh and I will try to go even higher, I have also won the Dauphiné and have been good in Switzerland." It remains to be seen whether Fuglsang is at the start of the Tour. The race programs have not yet been decided and Miguel Ángel López made himself a contender last season with podium places in the Giro and the Vuelta. "I do not know what Astana is planning, nor what will happen to the team with the new riders, I find it difficult to say anything about it," says Fuglsang. Also the Izagirre brothers will also be riding for Astana next year. CHAPTER2 will become the official frame supplier of what will be known as the Bigla team in 2019. CHAPTER2 is a performance road bike brand, designed in New Zealand by Michael Pryde. The relatively new cycling brand has quickly become a household name in cycling thanks to its quest to create something unique that follows a road less travelled. The road less travelled is a value that is shared with the team as it is known for discovering relatively unknown cycling talent and developing them into world-class athletes. "At CHAPTER2 our aim is to ‘Explore the road less travelled’ - through our design, dealer-friendly business model, and the way we approach the world of cycling. By coming on board with the Bigla Team, we are partnering with people who share our values, who live and breathe cycling, and who want to tell the story of cycling beyond the norm… Bigla offers the opportunity to see a Women’s team develop, challenge expectations and break stereotypes. Exploring the road less travelled," founder Michael Pryde said. The company recently received the Gold Pin at the 2018 DINZ Best Awards for its design of their RERE bike with its reversible seat post, integrated fork crown, hidden seat clamp and direct mounted brakes particularly catching the attention of the judges. "We’re excited to partner with CHAPTER2 at this stage of their journey," team manager, Thomas Campana said. "They are an exciting start-up, pushing the boundaries of design and reshaping how things have been done. The brand is about inspiring people to ride and explore and to not be afraid to take new less travelled paths. When you look at the athletes we have on the team next year, a number of them left conventional paths to explore their passion for the bike that has translated into professional contracts. Their boldness has been rewarded. 2019 is going to be an exciting journey for them with partners such as CHAPTER2." 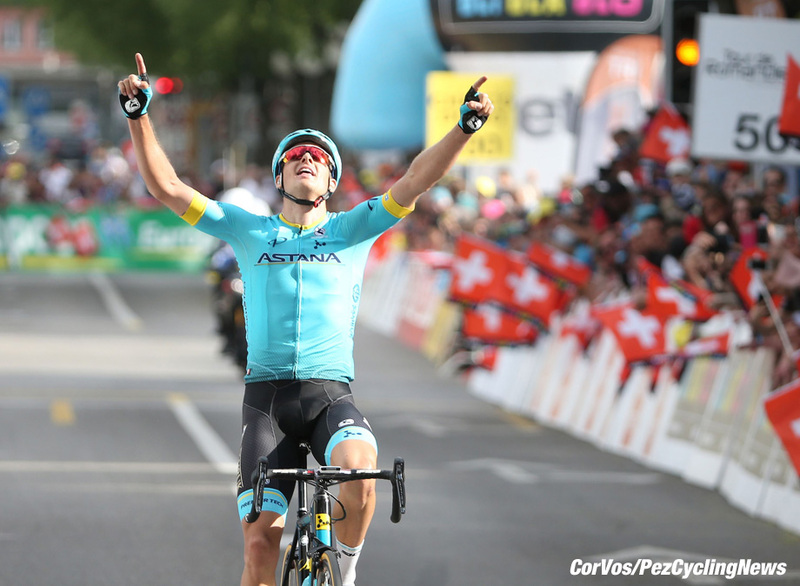 "I am grateful to Astana Pro Team for this huge opportunity. I am very happy and super motivated coming to this fantastic project. I am ready to give my all to help the team in reaching the biggest goals. I hope the new 2019 season will be a very exciting and successful for the whole Astana Team," said Hernando Bohórquez. Hernando Bohórquez (26) is a climber with some good abilities in time trial races. 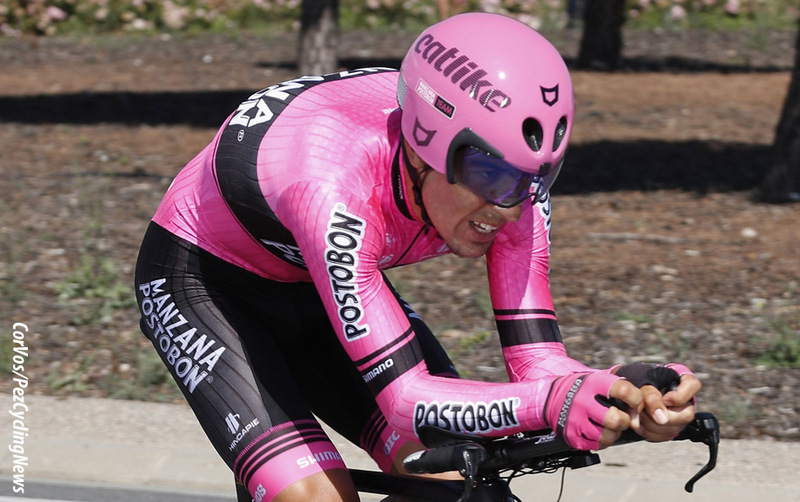 In 2018 he represented the continental team Manzana Postobon, getting some strong performances. For example, he finished second in the general classification of the Tour of Quinghai Lake. Bohórquez had a good start of his cycling career with a solid 7th place at the Under 23 UCI Road World Championships in 2012 and 2014 and a 3rd place at the Under 23 Pan American Championships in 2014. In 2015 he took a bronze medal in the individual time trial of the Colombian National Championships, while in 2017 did the whole Vuelta a España. Besides all these results, Hernando won a few local races of Colombian national calendar. "We are curious about the WorldTour start of Hernando Bohórquez, but he already showed some strong performances in Europe, especially at the World Championships. We bring Hernando as a rider, who can provide a good help in the high mountains to our leader Miguel Angel Lopez. They know each other very well, they train together and I think, this could help the team at the Grand tours. Let’s see how it will work in 2019," said general manager Alexandr Vinokurov. 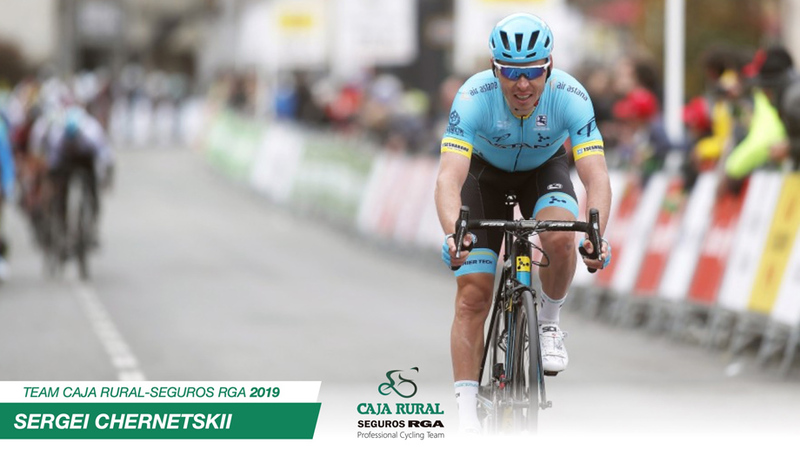 The seventh signing of Caja Rural-Seguros RGA for the next season is The Russian rider Sergei Chernetskii. After six seasons in the World Tour, he arrives to the Spanish team to bring experience to a young block and fight to add victories. He grew up in the lower categories of his country and became professional in 2013 with Team Katusha where he completed four campaigns in which he won the overall standing of the Tour des Fjords that same year and a stage of the Volta a Catalunya in 2015. The last two seasons he has competed for Team Astana, where he has continued a progression that has made him a more mature rider. This year his greatest success was the general classification of the Arctic Race of Norway and the third place in the Tour of Guangxi. In addition, he achieved several positions of honor and good performances in Poland or the World Championship in Innsbruck. Thanks to his experience, Chernetskii will lead the team in hard races to fight for successes in a demanding calendar. He joins the signings of Jon Aberasturi, Matteo Malucelli, Domingos Gonçalves, Alan Banaszek and neoprofessionals Xavi Cañellas and David González. Sergei Chernetskii: "I have chosen Caja Rural-Seguros RGA to continue my career because it is a good Professional Continental Team to continue improving as a cyclist. For me, 2018 has been my best season, winning Artic Race of Norway and 3rd place in Gree-Tour of Guangxi. My goal for 2019 is to achieve victories for Caja Rural-Seguros RGA, specially in the climb races". Groupama-FDJ has attracted Philippe Mauduit as a Directeur Sportif for next season. The 50-year-old Frenchman comes from UAE Team Emirates, who he worked for last season. 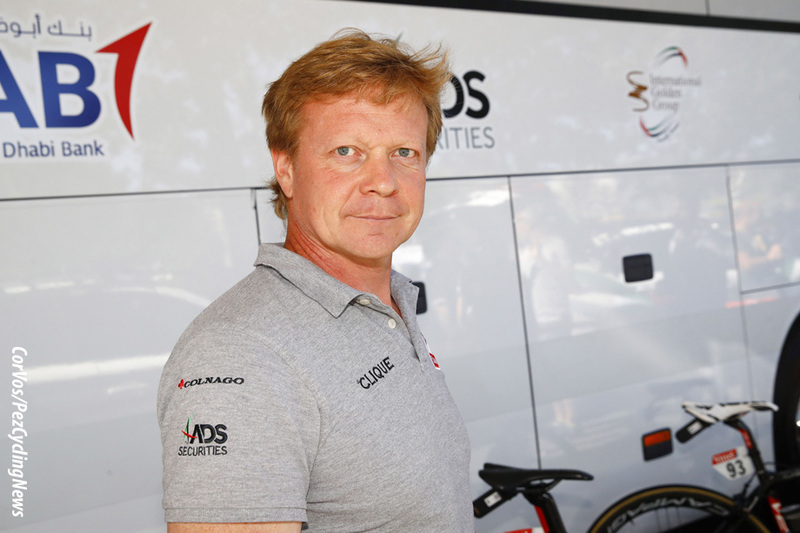 Mauduit has been a DS since 2006, he previously worked for Bahrain-Merida, Lampre-Merida and Tinkoff-Saxo. "I like the project of the team. I have been talking to Marc Madiot for a few years now and saw that everything he said came to fruition. I could not reject the opportunity he offered me. I have been working abroad for about ten years and am very happy to be back in a French team. I first have to learn a lot about the team and its working method ", Maudiut says about his transfer. Mauduit was a sports director at UAE Team Emirates last season. The Frenchman was a pro cyclist himself and is praised for his multilingualism. He previously worked at Bahrain-Merida (2017), Lampre-Merida (2015-16), Tinkoff-Saxo (2011-14), Cervélo (2010) and Bbox Bouygues Telecom (2006-09). 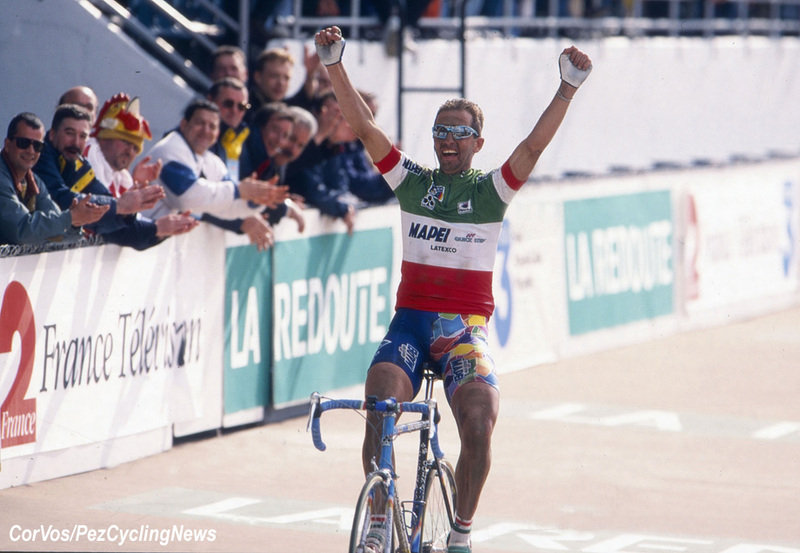 The 52-year-old Andrea Tafi has found a team that wants him to start in Paris-Roubaix. The Italian former rider and former winner of the Hell of the North does not want to say which team is involved. However, Tafi spoke with Patrick Lefevere, he told Het Laatste Nieuws. The manager of Deceuninck-Quick Step Floors personally put a stop to that plan. Tafi: "I spoke with Patrick. He said: 'Andrea, I have a very good team. I think it is beautiful what you propose to me, but I cannot possibly give you a place, because every rider who starts in Paris-Roubaix wants to win that race'. I understand that, of course. Luckily I found another big team. " "Unfortunately, I cannot say which one. Not yet", according to a mysterious Tafi. "Everyone says I'm crazy, but I do not think so. I follow my heart. I know how difficult it is, but I also want to see where my limits are. I am not going to hear you say where I am going to end up. I am not hypocritical. I'm going to train and see where I come out." The 1999 Roubaix winner will make a documentary of his preparations and he will do part of that preparation in the Mapei training center in Milan. Tafi will enter the record books. "It is something nobody has ever done in the history of cycling," he concludes. Michael Boogerd made his appearance on Thursday in the TV program Boxing Stars in Holland. The 46-year-old former pro was in the lightweight class against TV presenter and YouTuber Thomas Cox (28) in the boxing ring. Boogerd has been working with a coach in the last few weeks for the fight that was broadcast live on Dutch TV station RTL 5. In the program several famous Dutch people compete against each other in a boxing fight. 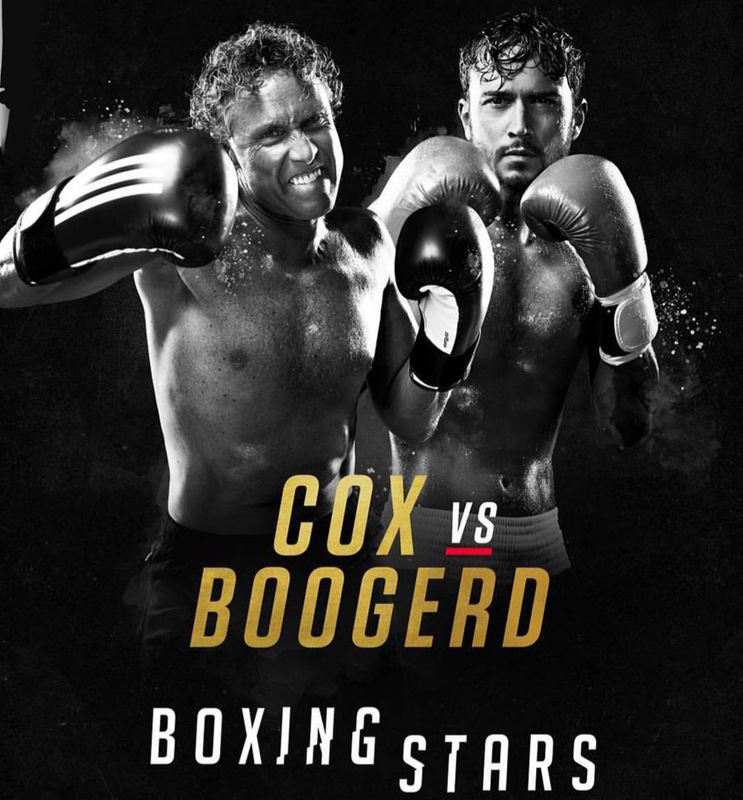 The bout lasted three rounds and in the last round Boogerd struck. Eventually the ex-team leader on the road was awarded the victory unanimously by the judges. Because of his victory, Boogerd will fight in the semi-finals. With preparation for 2019 well underway, new rider Eddie Dunbar discusses the start of his career at Team Sky, playing a vital supporting role in some key victories, and his goals for next season.